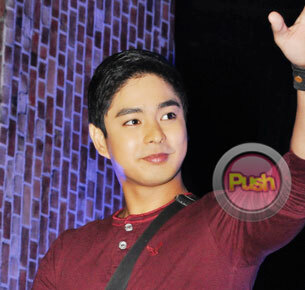 Coco Martin answers the issue that he got hitched many years ago in Canada. Recent reports in tabloids claim that Coco Martin got married during his stay in Canada way back during his indie film days. Apparently, this is supposedly the reason why he has always been elusive about having a girlfriend in showbiz. But the multi-awarded actor categorically denied such the reports, contrary to his married civil status as indicated in his Canadian passport which the tabloids supposedly got a hold of. “Actually, marami nga nagsabi sa akin niyan kaso sabi ko hindi naman ako umaalis. Saan naman nila nakuha yun? Eh, ngayon wala kaming [alis] dahil lagi kaming nagte-taping,” said Coco who granted an interview with the entertainment media right after he received his Actor of The Year Award at the Yahoo OMG Awards 2013 held at the MOA Arena last Friday night, July 19. When prodded if he ever got married in Canada prior to his rise to stardom, Coco replied, “Ang tagal tagal ko nang nandito [sa Pilipinas] eh. [Kahit dati] wala. Asked if he gets affected whenever he gets involved in controversies, Coco good-naturedly said that he understands that it’s part of the biz after all. “Hindi na po. Nagsisimula pa lang ako nasanay na ako sa ganyan. Tsaka nung pinasok ko yung trabaho ko, alam ko na kasama ‘yan."